This post comes from Dr. G. Jane Cook, chief scientist at The Corning Museum of Glass. 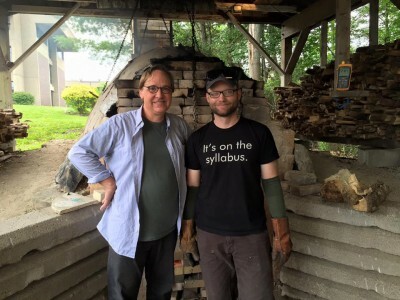 Professor Fred Herbst stokes wood into the firebox of one of Corning Community College’s wood-fired kilns. 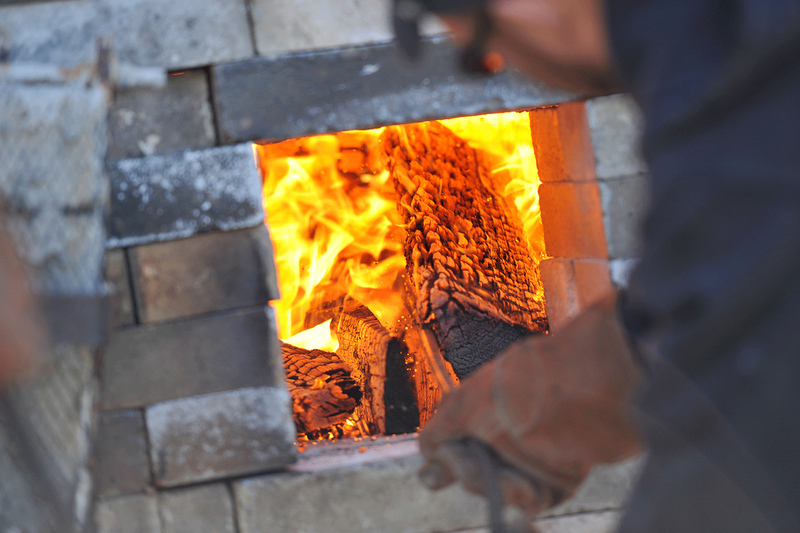 These well-drafted kilns can achieve temperatures in excess of 2200°F. Batch for the most common type of glass—sodalime—consists of, chemically, the compounds silicon dioxide (or silica), sodium carbonate, and calcium carbonate. Their actual sources are often referred to, by artists and suppliers, as sand, soda ash, and limestone, respectively. Silica sand can be mined from special deposits of very pure grains from ancient seashores, or from veins of quartz crystals, sandstone, or quartzite, but not the impure stuff one might gather up at the beach. “Soda ash” is no longer derived from the ashes of salt-loving desert plants, or seaweed, as in centuries past, but is made as a product of large-scale chemical factories; much of this sodium carbonate is used by the glass industry, but some finds its way into homes as “washing soda” laundry additive. The limestone used is a ground-up version of the stone one might see in landscaping or architecture, but again, great care is taken to find sources of the limestone that have an unusually low amount of iron and other impurities. 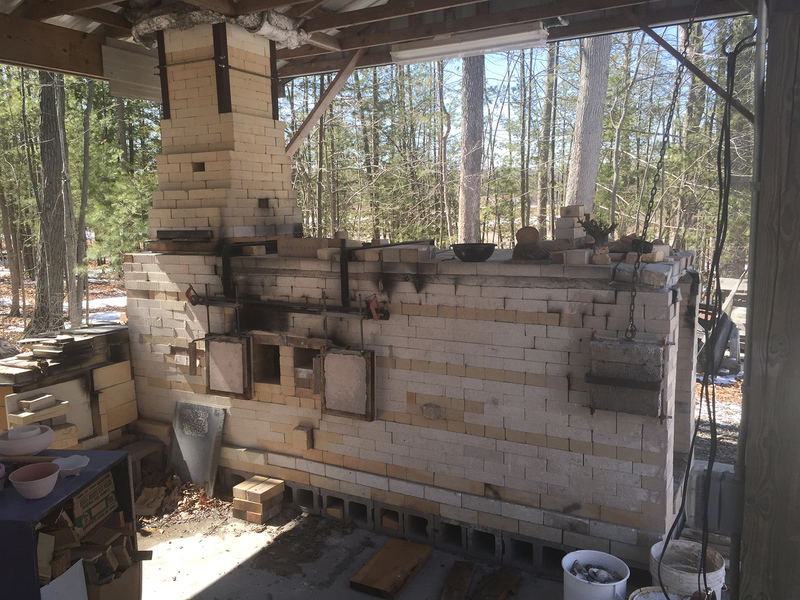 I’ve been gathering raw and recycled ingredients for glass from local rocks and plants, grocery and drugstores, and trash and recycle, melting the ingredients together in a local wood-fired ceramics kiln, and blowing the glass outdoors. The project’s motivation came on almost my first day working at CMoG, in September 2014. It was clear from questions being asked by the public, and coming from staff glassworkers, that despite efforts to explain the recipe for glass, there was a distance between the words that were being used and modern usage. Glass seemed too mysterious, made from distant inaccessible materials. But I knew that the stuff of glass is all around us, as glass itself of course in the form of used bottles, jars, and windows, but also in the ground and plants, and at the store! For the Batchshed project, I’m looking at essentially three types of raw ingredients: recycled glass from bottles and jars, common items one can buy at a drug or grocery store or garden shop, and stuff derived from local rocks and plants. For upcycling, I first take common container glass—blue wine bottles, green and brown beer bottles, clear pickle jars—and smash them by hand into coarse chips and sand-sized bits. Added to this is a special mixture of laundry additives, washing soda and borax (sodium carbonate, and sodium borate) purchased from the grocery store, as well as some silica gel—the stuff found in the drying packets commonly placed in many kinds of packages to control moisture. Fred works with Hartwick College professor Stephanie Rozene and students in April to bring the kiln up to firing temperature for their pottery, and melting temperature for the experimental batchshed glasses within. The recipe for glass from which machines make bottles is different than that used by gaffers working by hand: they say that it is “shorter”—it stiffens more quickly. This is good for a high speed machine making hundreds of bottles a minute, where it’s important to get a blown bottle out of the mold and on its way so another can be made. But a glassblower needs time to shape the gather, and remelted bottle cullet alone doesn’t give that time. The addition of a 20-30 percent of the soda/borax/drying gel mixture, however, “lengthens” the glass to make it more workable, without degrading the look or durability of finished glass. Drugstore glass also uses the silica drying gel packet material, in place of “sand,” but replaces the soda and limestone with Alka-Seltzer and Tums antacids. 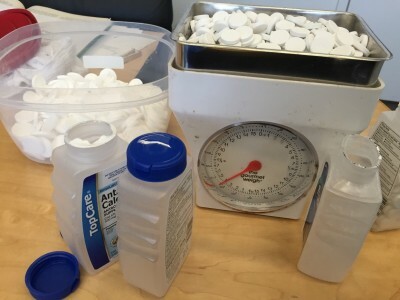 When heated, the sweeteners, colorants and other additives in these drugs burn away, leaving just sodium carbonate and calcium carbonate, respectively. The amount of each ingredient in the recipe can be adjusted to make a nice, easily hand-workable glass. While these glasses are made from ingredients that culture and economy bring into the area, work is also ongoing for the initial forays into glass sourced from local rocks and plants. I’m seeking advice from persons familiar with Twin Tiers and Finger Lakes geology and botany to assist in identifying the rocks and plants most suitable for transformation into a truly indigenous glass. CCC’s anagama-style kiln during heat up on July. CCC’s “train kiln,” named for its shape, that was used for the first batchshed firings in April, sits cold. The glass gathering ports are left-of-center. Fred began working with clay in 1994, and started wood-firing his work shortly after. He has always been intrigued by how the elemental force of fire can be used to heat a kiln to extremely high temperatures and at the same time imprint beautiful patterns of movement on the surface of the work in its path. Each firing is a complex dance between the types of clays used in the work, how the work was loaded into the kiln, what species of firewood was used, and what final temperature reached and for how long. “After more than 20 years of firing wood kilns, I feel like I have just scratched the surface of this both ancient and contemporary way of finishing ceramics,” he said. 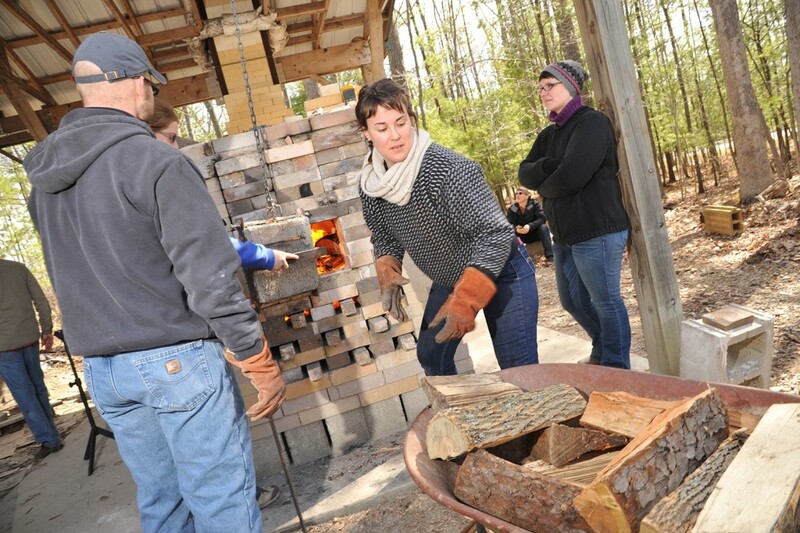 He first partnered with glassworkers from CMoG in 2006 to attempt recreations of ancient Roman glass melting and forming, and in 2009, hosted large enthusiastic crowds at the Glass Arts Society annual international conference to see the process, now dubbed “glassagama.” A new wood fired kiln was designed specifically to accommodate both glassagama and anagama firings simultaneously. One version of this kiln is at the Domaine de Boisbuchet in Lessac, France, where it is used by top art and design students from around the world to explore glassworking in a bucolic communal setting. The original is at CCC, and was used for the first two Indigenous Glass firings this year in April. A third firing was scheduled for Fred’s original anagama kiln in early July. Are you familiar with Twin Tiers and Finger Lakes geology or botany? Dr. Cook is looking for your help to identify sources of raw materials that can be turned into glass. Contact her at Science_Web@cmog.org.